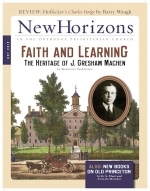 J. Gresham Machen was raised with the values of honest scholarship and confessional Reformed Christianity. That made him well suited for his studies and his later teaching career. These values were long held on both sides of his family. Charles Hodge (1797–1878) embodied the ethos of Old Princeton, whose two hundredth anniversary we celebrate this year. Hodge was not the passionate pulpiteer that Princeton’s first professor, Archibald Alexander, was. Nor did he enjoy the sheer brilliance of his celebrated pupil and successor, Benjamin B. Warfield. In the fifty-eight years that Hodge taught at Princeton Theological Seminary, however, he shaped more lives with his gentle good humor and unflappable fidelity to God’s Word than any other professor who taught there. “He was probably the best exegete Princeton ever had,” Benjamin B. Warfield once told Louis Berkhof. Abraham Kuyper was so taken with his academic acumen that Kuyper offered him the chair of Old Testament studies at the Free University of Amsterdam when he was only twenty-four years old. J. Gresham Machen commented that if he knew as much as he did, he would be writing all the time. Cornelius Van Til considered him the most erudite man he had ever known. “Oh no! He’s talking about retirement again—funds, investments ... blah, blah, blah ... finance, hocus pocus, blah, blah, blah....” Before your eyes glaze over, read on. “I’m a minister, not a financier. Why should I be distracted from the work of ministry?” Don’t turn that page; read on.